Her budget is small and as a small business owner, it should be. So I've compiled a few pictures that can serve as inspiration from places such as Old Navy, JcPenney, Uniqlo and Forever 21 amongst others. I am also doing a video with instructions and tips for her to take with her while shopping. Yadira from Club de Las Diosas, will be assisting this anti-shopper and helping her stay under budget and making sure she gets items that can mix and match to get as many looks possible from just these ten items. 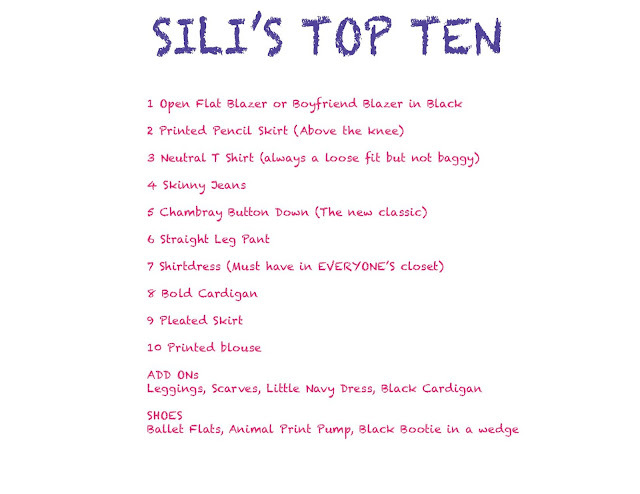 Only ten items ladies! Here are her inspirational shopping guides. Good luck Sili and Yadira. The trip will be documented so we will be sharing that with you as well as her purchases, and we will have a few other bloggers joining us in this massive project to help our anti shopping friend so stay tuned. Can I tell you how much I adore this?! THANK YOU! I know I've been giving you a hard time but I so appreciate you taking the time to help me with this. It really does mean the world to me. I have a stylist y'all!!!!! Woohoo! I love how simple you made it for us. Sili is going to get her swag back - the right way! Can't wait to see how the shopping goes this weekend. I cannot wait to see what she ends up with. This is going to be great! This is going to be an adventure. Can't wait!